I had time for a lunchtime session, and I had to pick one of the brew pubs on my list. Pivovarský dům was conveniently situated, reachable on foot from my hotel – and with a tram stop with direct connection back to my hotel. The facade is very impressive, you don’t seem to pay much for window space in this part of town. Lots of breweriana inside the windows, but when you open the door, the place is more intimate than it looked like from the outside. A lovely aroma of malt fills the room, there is no doubt that this is a working brewery. There is a substantial many of Czech staples. I consider duck or game, but en up ordering a goulash with dumplings. The beer range is rather special. In addition to the expected light and dark lagers, there is a range of flavoured beers as well as a weissen. 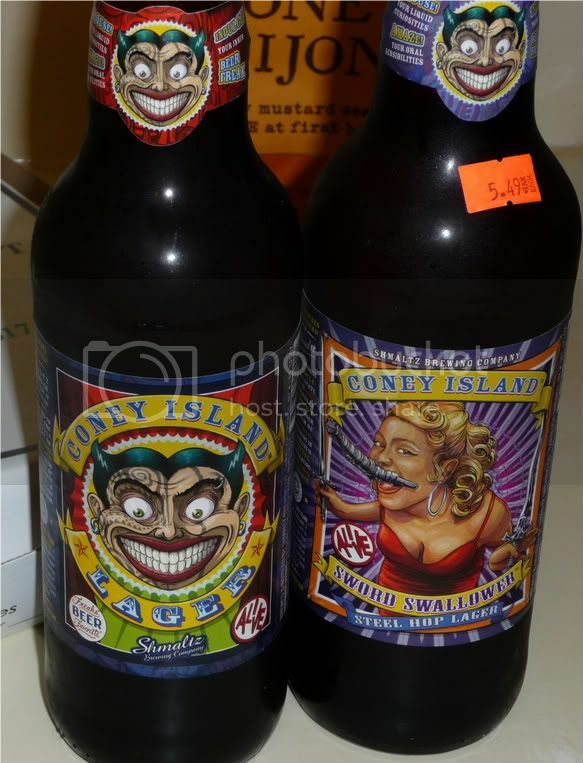 Some of these are obviously brewed mostly for novelty, like the banana beer and the nettle beer. It is therefore very convenient that they have specially designed sampler devices, more or less modelled at the Kölschkranz Alan is yearning for. How were the beers? Both the svetly and tmavy, the light and dark, were good representatives of the style. The light beer was both light and refreshing, with a lovely bitter tail that keeps growing. Flowers, mint and grass. The dark had cocoa, coffee and a little cocoa. Quite subtle, a beer you could keep drinking all night. On the sweet side, but there was a dusty dryness, too. I ordered a half liter of this to have with my meal. The other beers? To be honest, none of them appealed very much to me. The added ingredients overpowered the beer. I think brewing some of those to a higher strength could possibly have made them more balanced and enjoyable. The goulash was splendid, the prices were very decent. I did by no means regret visiting. But will I be back? I think there are lots of other places in Prague I’d like to explore first. Shortly before five, a text message told me Max had arrived at my hotel. I handed over the beers from the Norwegian micros, and we set off for Zlý Časy. Half an hour and two tram rides later, we arrived. The first time I visited, last year, this pub has some sort of festival going on, meaning that they had an outstanding range of beers from micros on tap. Well, they have moved beyond that. There are16 beers on tap in this fairly small bar right now, a new Prague record. Two Germans, an Oktoberfest and the Sclenkerla Märtzen, the rest quality Czech brews. A few Weissen, a Scottish ale and a long list of lagers, some of them yeast beers, some of them just lovely pilseners. Fast and friendly service, and they seemed to treat all customers well. But it is very nice to be with one of the regulars – who also knows the language -in a place like this. I hope this concept will work, though having such a broad range of beers in such a small pub sounds risky, especially with a number of beers that have to be sold in a day or two after opening the keg. 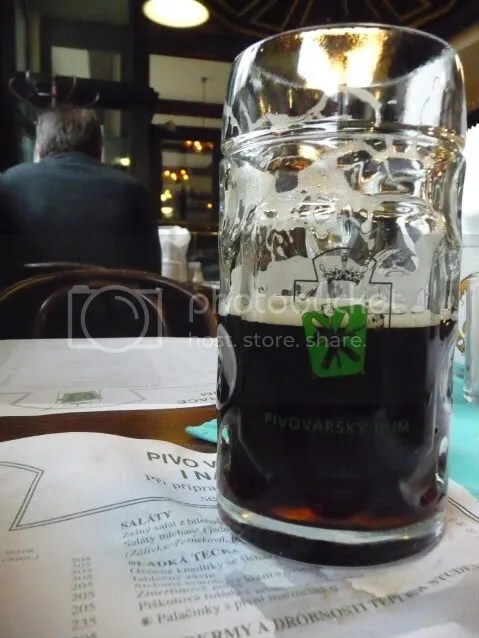 But this is not the place for tickers sipping from small glasses, you need to ask for the half liter and let the golden liquid flow freely down your throat! A pleasant time spent in pleasant company. Max and I have only met twice, but we get along very well, with no uncomfortable gaps in the conversation. Sure, there are lots of beer bars in Prague I haven’t visited. But I’ll make sure I’ll hit Zlý Časy the first evening the next time I’m in town as well. And even if they have Nøgne ø beers on their list then, I’ll always go for the local brews. They have reorganized their web site over the last week, making it easier to see the ever changing beer list. Today they have Chimay Tripel on tap if you want a small break in your lager consumption. To Prague for a meeting this week, and I, obviously, used the opportunity to do some beery things as well. I had an appointment with Max, the Beer Philosopher, and I even brought along quite a few beers to him from Nøgne ø and Haandbryggeriet. He is considering importing some of their beers. While they obviously cannot compete with the price level of the domestic brews, it will be interesting to see if there is a market for ales in this land og lagers. I’m sure he will blog about this himself. I knew the routines for public transport from my last visit, and within an hour of touchdown I checked into my hotel, despite having used both the airport bus, the Metro and a tram. It was still early afternoon, and I had an hour or so to spare. This place is a bit of a paradox. Across the street from one of the major churches on the castle hill as well as the palace housing the Ministry of Foreign Affairs, this is still an unpretentious bar with wooden furniture and a menu that’s blissfully short. There is cheese. And sausages. And beer. The beer in question is Kozel, which may not sound too exotic. Their dark variety is a global brand, but having it fresh from tap is very different. Lots of sweet malt, but there are lots of other complex elements there as you sip your pint. 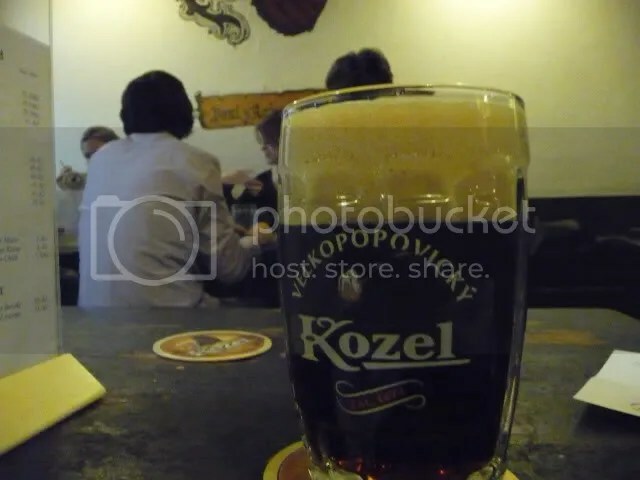 I tried a glass of the pale Kozel, too, a crisp and clean pilsener that also does its job very well when it is served under optimal conditions. Mixed clientelle – students and tourists in smaller groups. When I see people lighting their cigarettes, I realize that this was common across Europe just a few years ago. I don’t know if there is any pending legislation in the Czech Republic. I will not go into details about every visit abroad in 2008, but I want to mention some new beer experiences. I have been to all of these cities before, except Riga, but not necessarily with an emphasis on beer. And yes, I’ve been to Italy, England, Ireland and other countries, too, even if they did not make the short list. I went with my family to Riga early in the year. It is not a sensational beer destination, but there are very decent lagers to be found, from light session beers with a hint of honey and a full grainy flavour to Baltic porters that have made a revival. Good beery food, too, especially the buffet restaurants. I have been to Berlin twice during the year, and I was pleasantly surprised. There is a fine range of brew pubs scattered around the city, but with logical, fast and clean public transport, you can cover quite a few, even if time is limited. One of the natives found the idea of blogging about beer fairly stupid when I explained it in rather rusty German. I particularly enjoyed Südstern, with delicious food and guest beers in addition to their own. My last visit to Prague was in the mid Eighties, a gloomy city under the iron heel of their Russian masters. To return on a lovely summer day to the Golden city that has returned to its rightful place among the free nations touched my heart. It is a cosmopolitan place, too, I particularly enjoyed a whirlwind tour of some beer bars with Max the beer philosopher. I can assure you I will not wait decades before returning! Copenhagen hosted a major European beer festival in the autumn. Lots of fine beer, remarkably well organized despite an unexpectedly huge turnout. I enjoyed the social side of it, too. Lots of the ratebeer people from Denmark, the UK, Sweden, Norway, the Irish Craft Brewers… A fine opportunity to chat with brewers and other professionals in the industry. All in all a splendid event. I was hoping for a repeat in 2009, but my informers tell me they will probably return to a smaller format festival in May. This is run by volunteers, and having a huge festival every year is stretching it too far. It’s been more than two decades since I was in New York, too, ad I enjoyed my return very much. 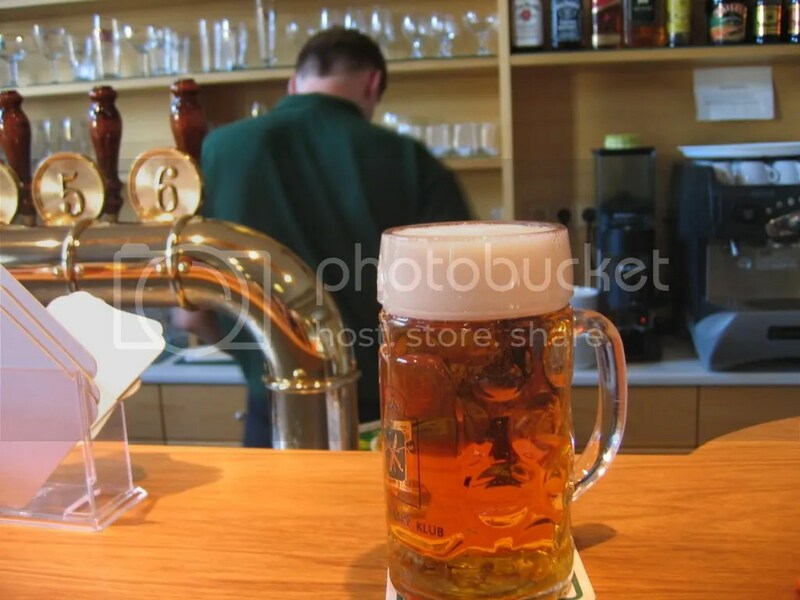 It is a fantastic beer destination, where all types of restaurants having fine lists of draught beers and even modest delis have several dozen craft beers in their fridges. Some outstanding beer bars and specialist bottle shops, too. I’d jump on a plane right away if I had the opportunity . Favourite? The Ginger Man. 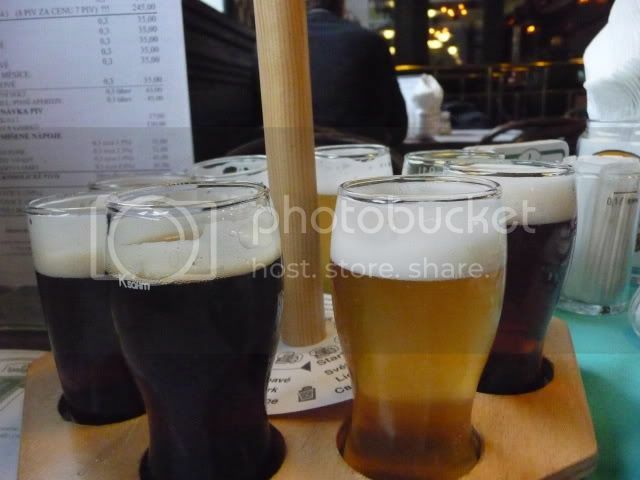 Max in Prague has blogged about the beers I brought him. I’m afraid they are not representative of the stuff you would find in an average Norwegian supermarket! His blog is bilingual, and you can find the Spanish version here if you prefer that. I’m strolling along Ceskoslovenske armady, the Czechoslovakian army street, in northern Prague when I notice a sign promising beer from the Cerna Hora brewery. Since 1530, it claims. I had a few of their beers in Dublin recently, and that was really good stuff, so it is tempting to try them on their own turf. And, for once, there is a beer place that is not on ratebeer or in Evan’s book. 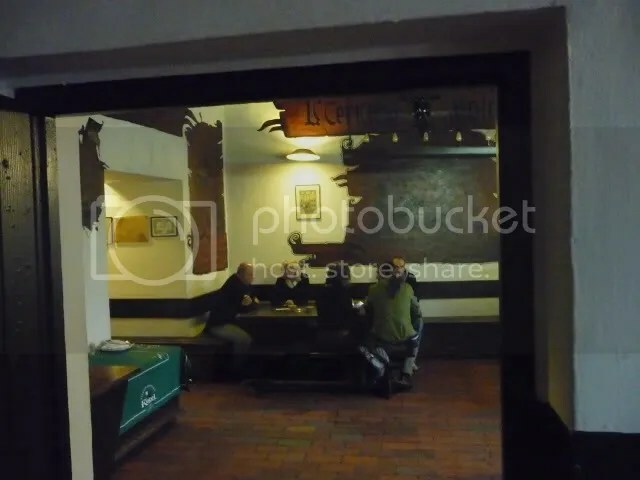 I decide to look inside the Zlaty Rozen, and it turns out to be a cellar restaurant. Five beers from the Cerna Hora on tap plus eight in bottles. And one of the beers on tap is the unpasteurized yeast beer. There are families having a meal here, a few bureaucrats or businessmen. There is a sinister building on the other side of the street that looks like it belongs to the Ministry of Defense, so perhaps they work there. Rather loud music. The decor is partly old brewery photos, partly seventies COMECON style. 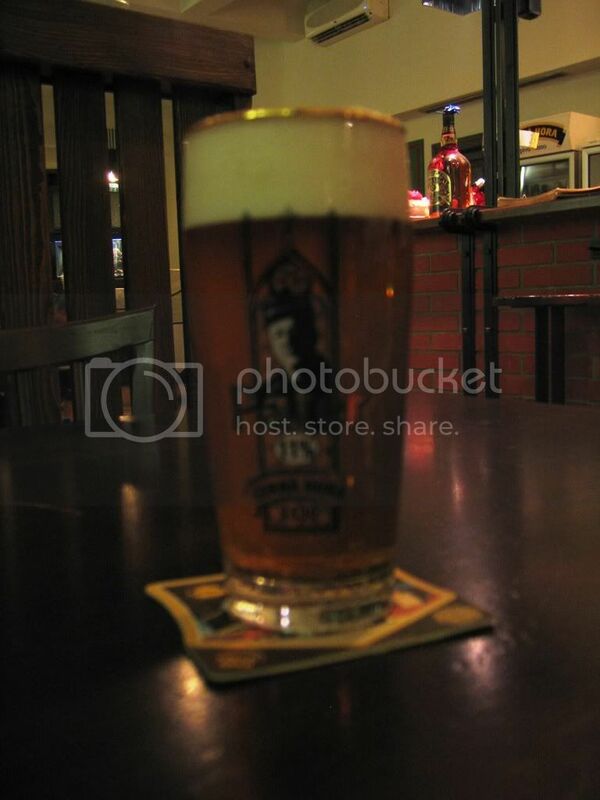 The sklepni, the unfiltered beer, has a head like whipped cream. It is soft and smooth, then the hops creep up on you. Subtle, rather than an explosion of taste. Long lingering bitterness in the finish. One more? The Granatis a pitch dark beer with a beige head. Roasted malt, bread crust, like when you left the bread in the oven ten minutes too long. A sooty sourness that plays along with the sweet malt. Truly great. I must be on my way. I google the place, and see it has won several pub awards and has an excellent English web site. Not so obscure after all, eh? And no awards for the photos today, I did not have any intentions about focusing on the Chivas bottle!